Welcome to the Manchaca All Stars website! Come, get a plate of fish or a piece of home-made pie, and listen to some good old bluegrass music. 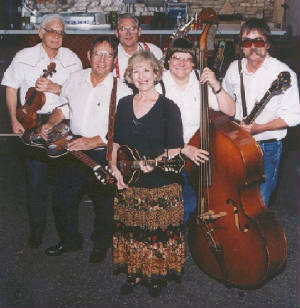 We are a wonderful group of musicians that have been playing at the Manchaca Firehall in Manchaca, Tx., (and elsewhere) for more than 20 years. We introduce the "All Stars" as "all the stars that weren't playing somewhere else tonight". That is because this band operates on the solidity of the member's musical skills and their love of the music. We each bring something special to the mix. We can play with as few members as 3, but generally carry 5 or 6, and, if one of us must be absent because of a schedule conflict, there is another "member in waiting" awaiting his turn in the wings. We can do this because we are really a house band that simply does more. 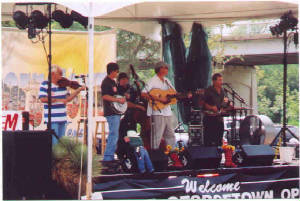 We can even add a 7th member so that every instrument, even the fiddle-style harmonica, is covered and well presented. Now, you wonder, why do we let our members move about? Well, because we have a great deal of talent to chose from, and if one of our members must be somewhere else, then the Firehall audience gets the treat of what the replacement member will bring to the band. Some of the favorite replacement members are below. The current line-up at the Manchaca Firehall: George Smith (fiddle), Buck Buchanan (dobro, vocals), Ben Buchanan (guitar, vocals - in back), Gloria Buchanan (mandolin, vocals), Cara Cooke (bass, fiddle-style harmonica, vocals), Dave Seeman (banjo). Festival on Labor Day Weekend in Georgetown, Tx.